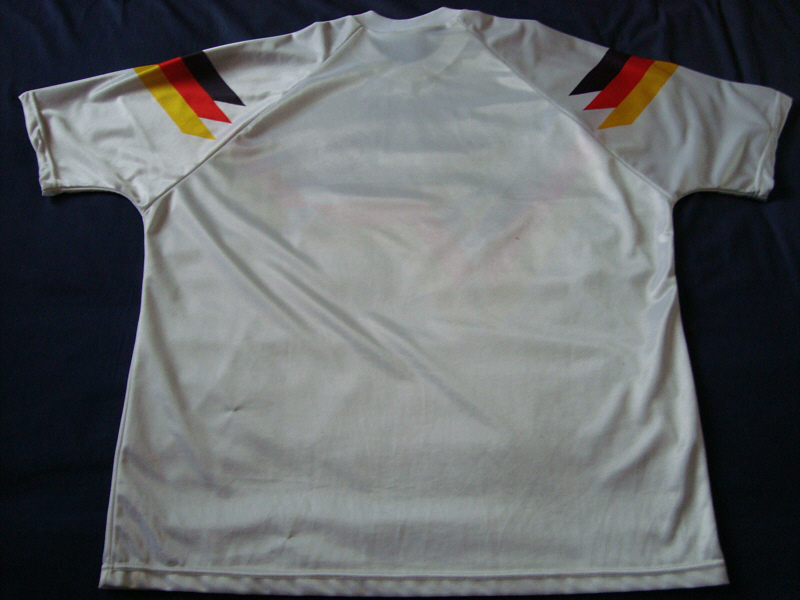 Home: white shirt with black trim and “Schwarz-Rot-Gold” flag design, black shorts, white socks. Away (I): green shirt with white trim and “patchwork tile” flag design, white shorts, green socks. 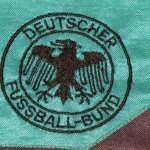 Away (II): green shirt with white/black trim and “Schwarz-Rot-Gold” flag design, white shorts, green socks. 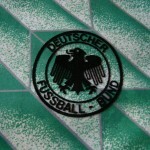 Coaches: Franz Beckenbauer, Berti Vogts. 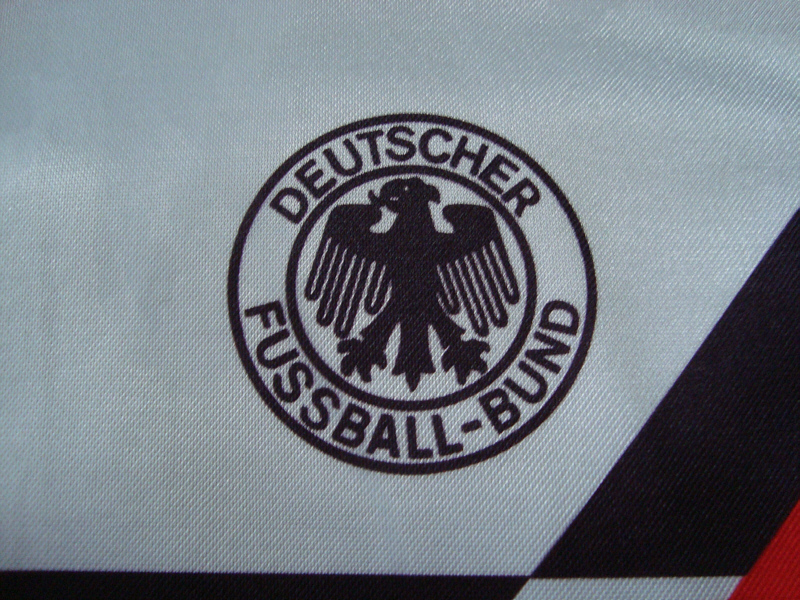 Prior to 1986 the then West German home shirt was purely Schwarz und Weiß – with not even a dash of colour. 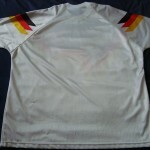 The white shirt for the 1986 World Cup finals in Mexico would see the first signs of Farbe – a very thin sliver of Schwarz-Rot-Gold on the neck – which would pave the way for the release of what is now seen as one of the most iconic Trikot designs to grace any football field. 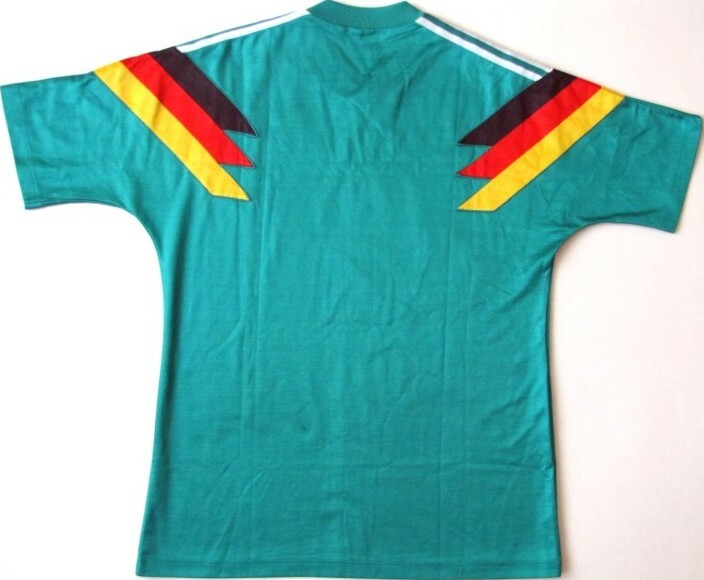 The now-famous “flag” shirt would be first seen in the spring of 1988, during the four-team tournament featuring Argentina, Sweden and the Soviet Union – an event in West Berlin where Germany would lose on penalties (yes, you read that correctly!) to the Swedes. 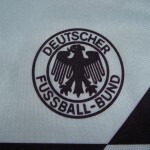 This ground-breaking design featured the Schwarz-Rot-Gold flag across the width of the shirt, and cascading over the shoulders, and was connected to the neck by three black stripes. 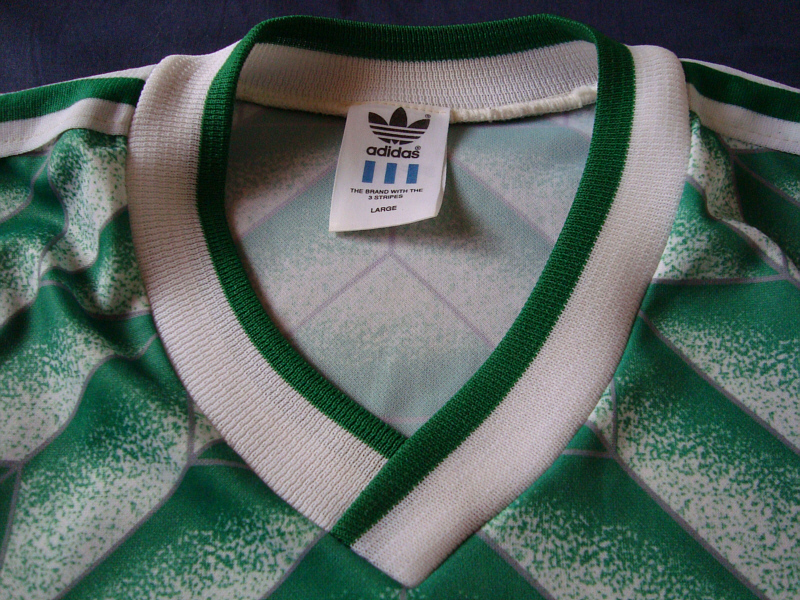 There were actually two designs for the neck: early versions had a round neck, while that used in Italia ’90 had an “overlapped” look as can be seen in the accompanying images. 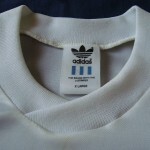 The shirt was always worn with plain black shorts and white socks with the three trademark Adidas stripes in black. 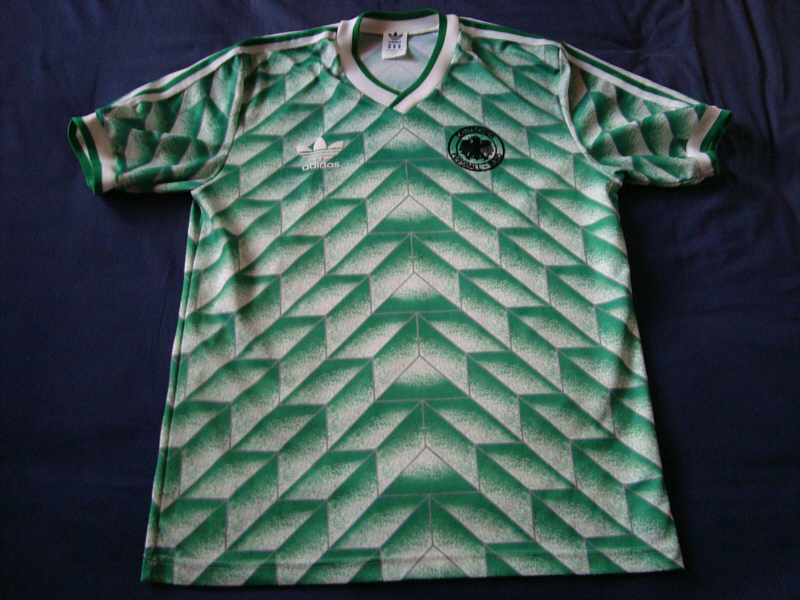 Numerous versions of the replica home kit were produced, and while on some the black Adidas logo and national eagle were woven the vast majority were like mine in that these designs were part of the garment itself. 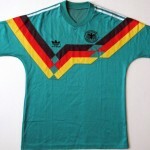 In the days before a new design was brought out before every major tournament, this much-loved shirt was sported by the Nationalelf for just under five years, and appeared during both the European Championship held at home in 1988 and the World Cup in Italy two years later, when Matthäus and Co. lifted the coveted gold trophy for a record-equalling third time – which led to coach Franz Beckenbauer becoming the first man to both captain and coach a World Cup-winning side. 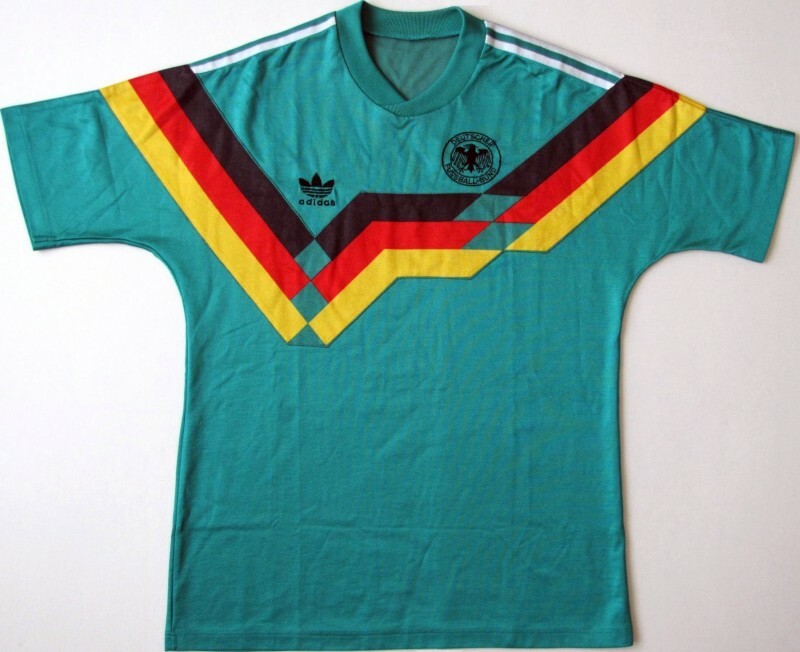 Many memories are associated with this shirt – the bad in the form of the almost catastrophic last-gasp defeat to the Netherlands in the Euro ’88 semi-final in Hamburg, and the positively wonderful run in Italia ’90. 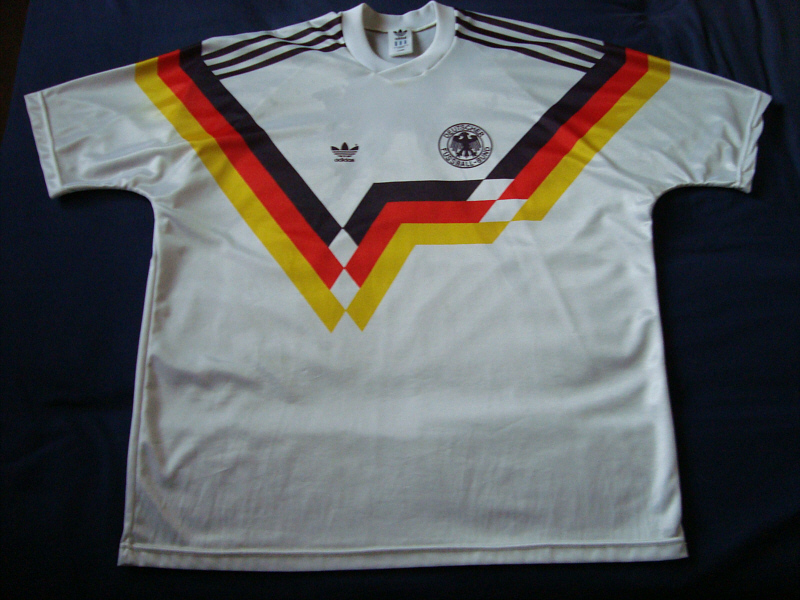 While most people would no doubt associate this design with the final of Italia ’90 and Andy Brehme’s winning spot-kick against what was a dire Argentinian side, my lasting memories will always be of the 2-1 second round defeat of the Dutch in Milan – the game which saw Rudi Völler’s spat with Frank Rijkaard and a stunning headed goal by Jürgen Klinsmann. 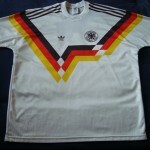 If I were to associate a single player with this shirt, it would be Stuttgart’s most famous blond bomber. 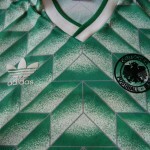 The second shirt – which also made its debut in the 1988 Berlin tournament against Argentina – could be described as “green with bits of white”. The design was difficult to describe, but was very similar in look to the v-necked “patchwork tile” orange shirt sported by the Dutch when they won in Euro ’88. When one looks closely it looks like a series of gradiented green/white arrows pointing upwards. 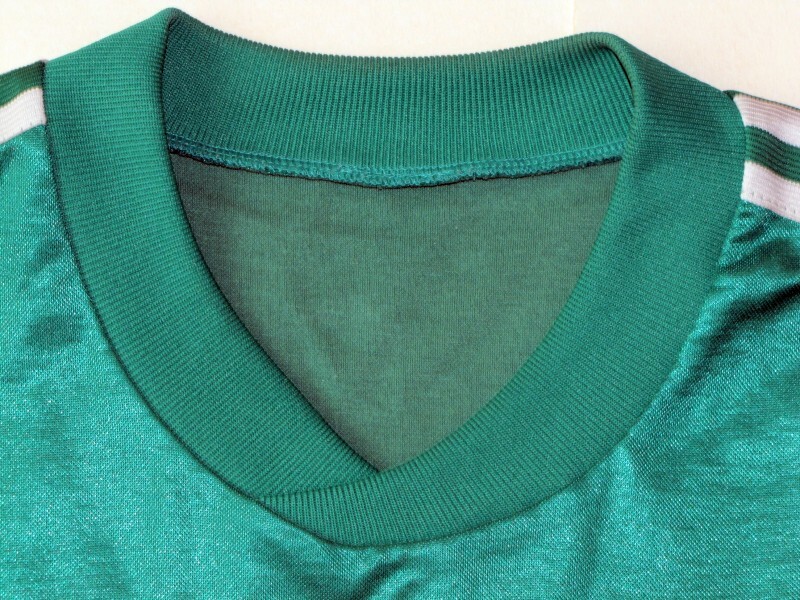 Over the years the look and design varied slightly – the colour ranged from a more traditional green to what looked like a green-turquoise, and on earlier designs there were collar flaps. 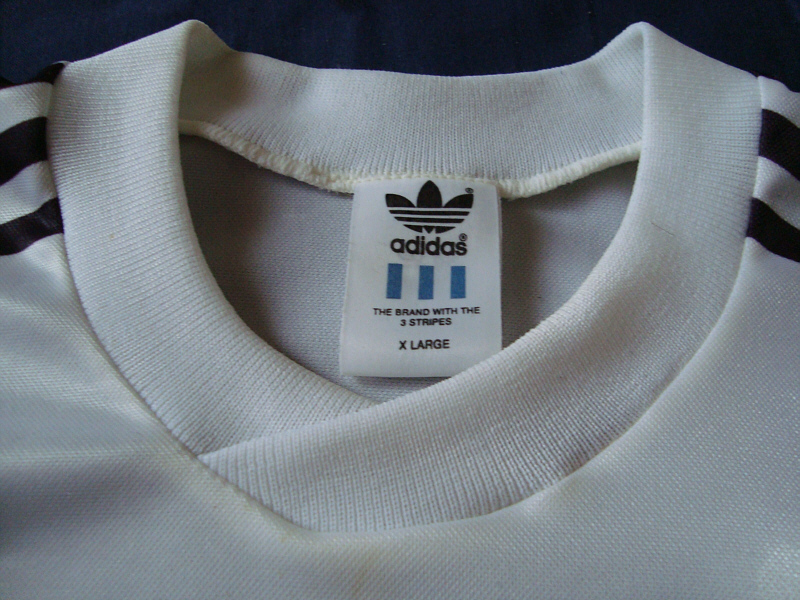 The shoulders were adorned by three white stripes that extended to the bottom of the sleeve. 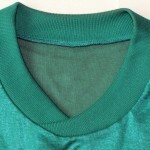 The shirt was always worn with plain white shorts and green socks with the famous drei Streifen in white. The match shirts themselves had woven-on badges, and replica items took on a number of guises. 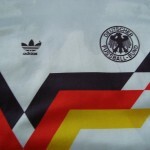 I have seen versions with woven Adidas logo and national eagle, but the most common looks like mine with the Adidas trefoil in white and the national eagle in black, both ironed on. 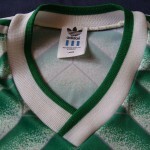 These were the days before international football shirts had hit their marketing boom, and it is highly likely that many were made to order hence the many variations; it is also likely that the national eagle was applied at a different time from the Adidas logo, hence there being different colours. 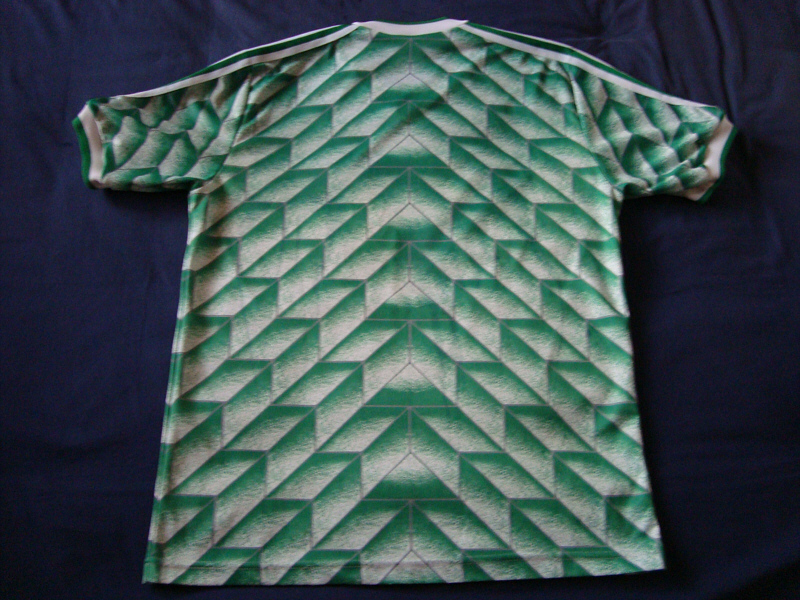 This unique and now rather cult green shirt was worn by the Nationalelf on only a few occasions, but by far the most famous was the semi-final of Italia 1990 in Turin against England which saw Germany triumph in a nail-biting penalty shoot-out. 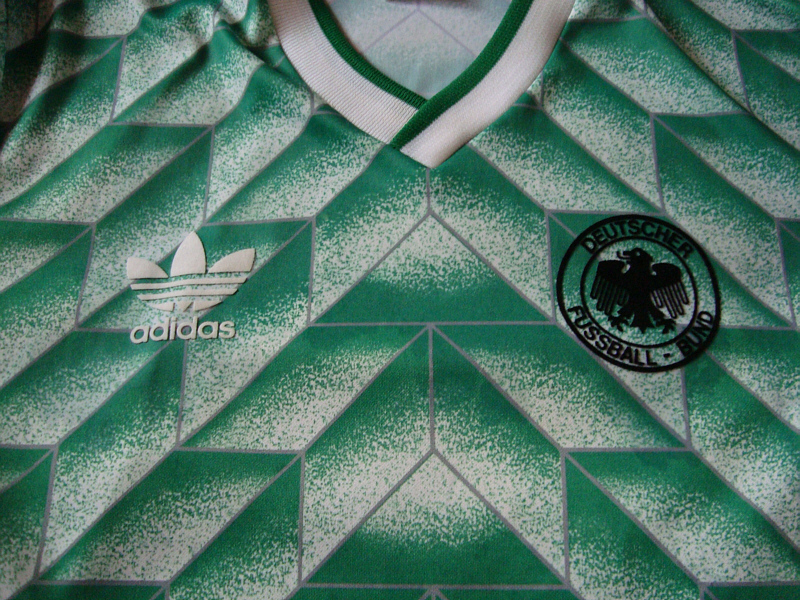 The player I’d most associate with this shirt would be the diminuitive Schalke 04 midfielder Olaf Thon – mainly for his celebation after he had smacked his spot-kick cleanly to Peter Shilton’s left. 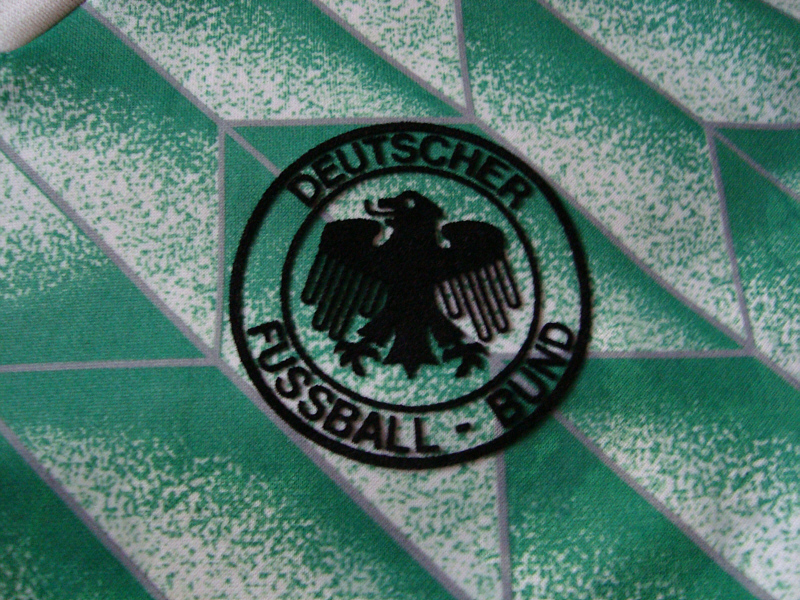 A special one-off edition of the green shirt (with the famous “flag” design) was worn during Germany’s first match against England as an united country at Wembley in the autumn of 1991 – the match being won 1-0 courtesy of a Karl-Heinz Riedle header. It shared the same look as the famous white version, but had a few quirks in that while the three shoulder stripes were white both the Adidas logo and national eagle were black. 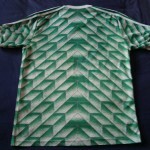 As with the “patchwork” green shirt, this design was also worn with plain white shorts and green socks with the Adidas “three stripes”. 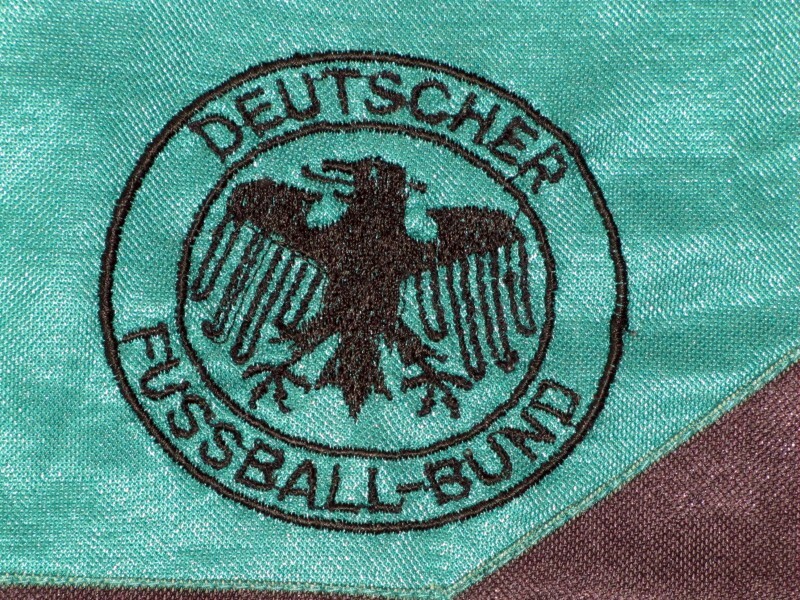 Given its rarity – it is highly unlikely it was ever marketed officially – this is the only DFB shirt from 1987 onwards that I do not have in my collection. The images in the gallery have been kindly supplied by MarcinK. White: v Sweden, 31.03.1988, Berlin. 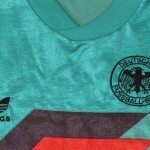 Green: v Argentina, 02.04.1988, Berlin. Green “flag”: v England, 11.09.1991, Wembley. 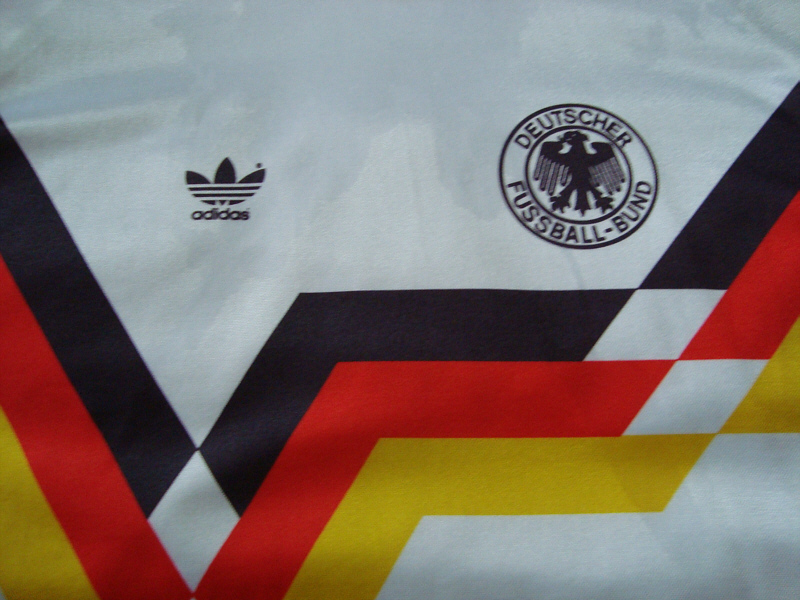 Do you have 1991 Germany away shirt? I am a football shirt collector from England. 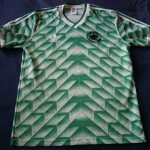 I am writing to let you know that i have the Green “flag” v England 1991 shirt in my collection, which i am now wanting to sell. 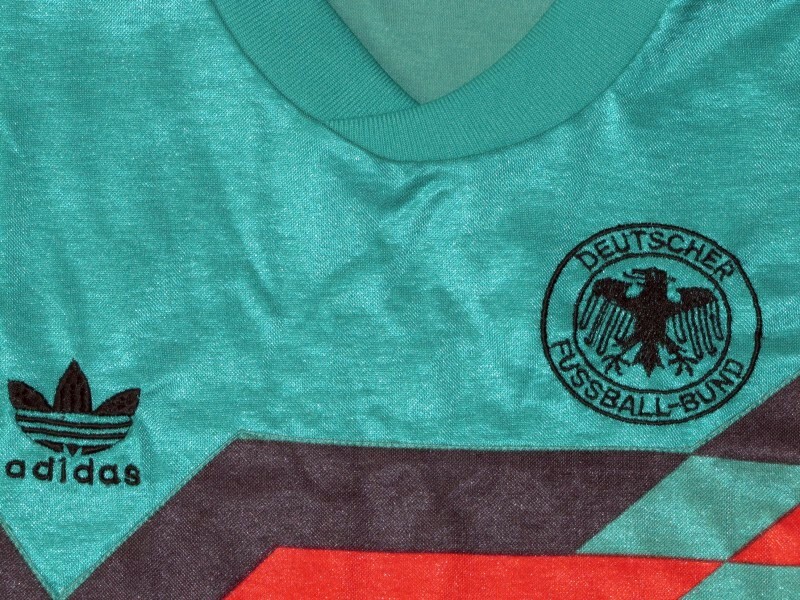 As you know this shirt was never made commercially for the public to buy and the shirt i have is a match spec shirt with embroidered eagle and adidas. it is also made from thicker high quality material. i believe it it an unused match shirt which was a spare in case the team neededed extra shirts. that explains why there is no number on the back. this means the shirt is in perfect condition. if you or one of your contacts are interested in buying this shirt then please let me know. i can supply you photos. do you still have own this shirt? 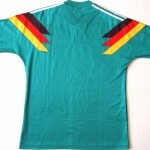 Do you still have your 91 green flag Germany away shirt for sale? Hi! I have this green Shirt for Sale. Are you still interested? Have you got an image? You can send it to derchef [at] schwarzundweiss.co.uk. Danke!